Spend less time jotting notes and working out math, so you can focus on your own DIY vision. new chair that fits in your apartment's floor plan, or hang new shelving in your kitchen. It enables us to visually plan with dimensional reference, and then guide us to points to make those changes in real life. Cubit will then guide you with turn by turn directions to make your design a reality, bringing your project to life. Cubit connects to your smartphone via Bluetooth and transmits information in real time. Our app functions as your design center, enabling you to integrate photos of your actual space using mixed reality to get the feel for how the final project will look using actual background dimensions. 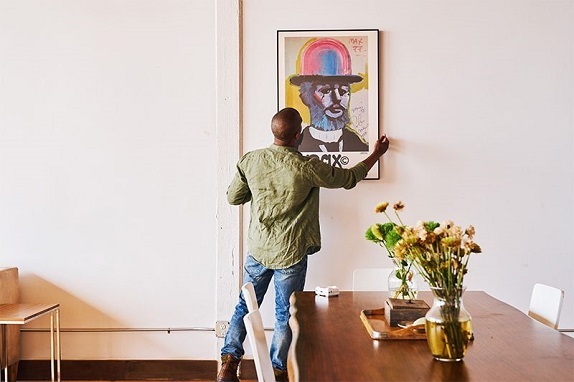 Add features based on their actual size, whether that is hanging pictures, cabinets, windows, or painted features. Now you have a visual design in real life scale that is fully interactive and easily manipulated. Once you've finalized your design in the app, Cubit assists in making it a reality. For example, after you layout exactly how you want your photo wall to look, use Cubit to guide you to each point on the wall where you should put a nail. Simply select the direction to start guidance, which coordinates to start with (horizontal or vertical), and hit guide. Cubit will guide you via the uploaded coordinates to the exact spot in real life. No more complex calculations or measurements. 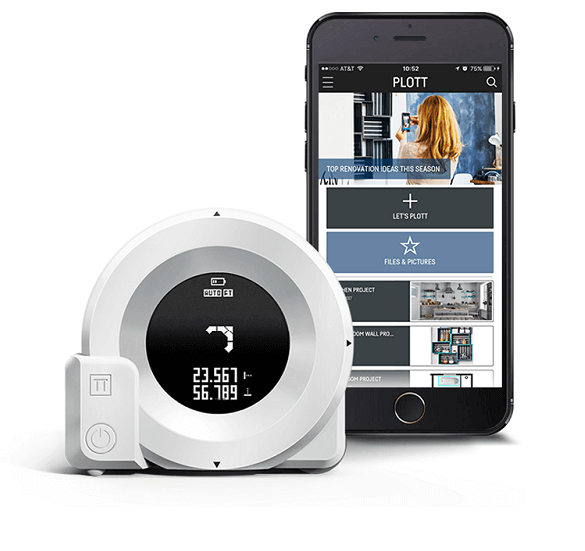 Design in Real World Context and Scale using Plott Technology, Then Follow Cubit’s Laser Guidance to bring your design to life without tape measures and levels. Use the dual laser distance measurers for height and width of a space up to 100ft. For irregular shapes, Cubit features a dimensioning wheel stabilized with two rolling balls on the underside for smooth gliding on any surface. 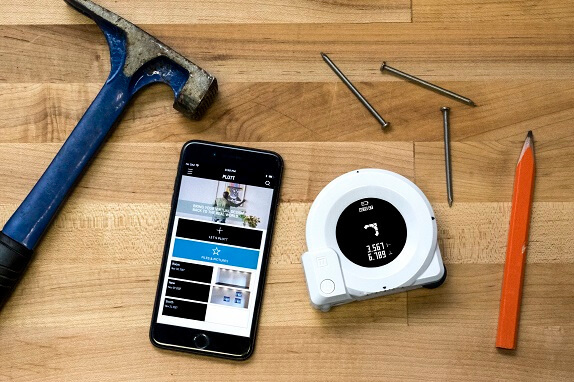 With Cubit, you can easily measure anything and save directly to your smartphone. Ease of use doesn’t account for anything without accuracy. Cubit has been rigorously tested and undergone prototype redesign to ensure laser accuracy to the industry standard of within 1/8 inch for every 30 feet. The wheel measurer is accurate to .02% in lab conditions, so every project is done correctly. 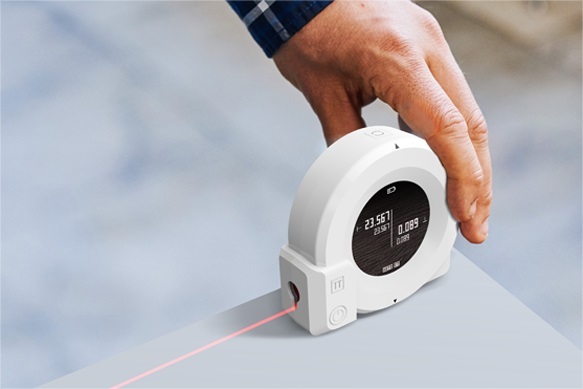 Cubit features two laser pointers as measurement guides, one horizontal, one vertical.Each can measure a distance of up to 100 feet! With the two lasers you can measure height and width at the same time. The lasers will also self correct accounting for changes in angle so you always have a level measurement. 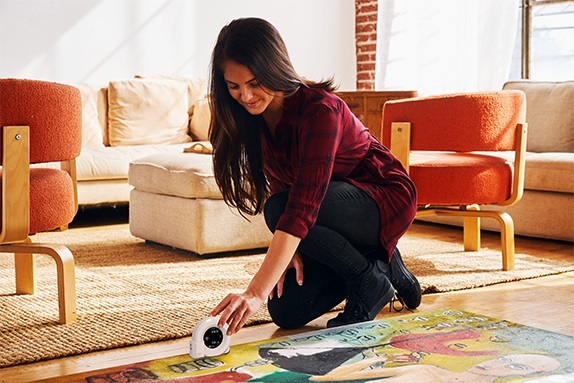 With the addition of the rubber wheel you can measure any irregular surface, such as furniture or sculptures, accurately! On the job, your tools can take a beating. We’ve made cubit out of ABS plastic to be durable enough to withstand drops on all 6 sides of up to 1m or 3.3ft. Cubits laser guidance system allows you to follow the unit to points, like a GPS, so you know exactly where you are going to drive that nail or make your mark for a perfect job everytime! Cubit takes care of all the complex math and allows you to focus on your creativity! With an easy to read display and auto adjusting functions, no matter the angle you hold Cubit, the job will get done correctly. Cubit connects to your smart phone via Bluetooth so you can bring the virtual world to the real world. With all of Cubit’s capabilities there is nothing stopping you from taking on new and more complex projects! Whether its hanging a picture or installing cabinets you can do it with Cubit!